Under the spiritual care of Father Joyson our parish is organizing a pilgrimage to the Holy Land from February 21 to March 1 in 2019, total of 9 days. 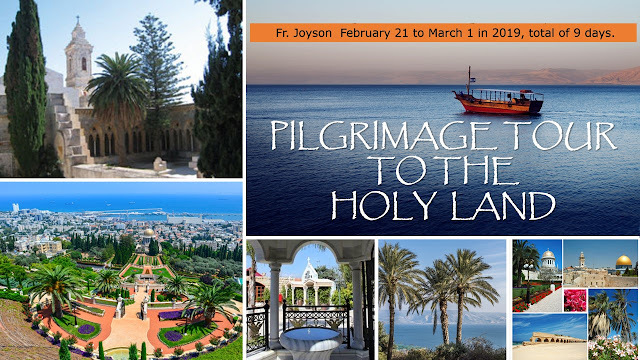 As parishioners of St. Martin of Tours this is a great opportunity not only to follow the footsteps of Christ but also to enjoy each other’s company. A flyer detailing the itinerary, all relevant information and registration form can be obtained from the parish office. To ensure your reservation (on first come first served basis) please submit your completed registration form together with a deposit to the parish office. A representative from the travel agency will come to our parish on Wednesday, September 26, 2018 at 7:30pm for an information session. Happy travelling!